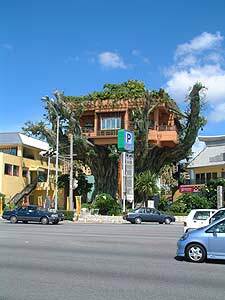 While driving down highway 58 towards the Naha Airport, it’s rather difficult to not notice a large tree shaped restaurant complex on your left hand side. I’ve often driven by and wondered what the restaurant was like, so this week I finally decided to drop by for a meal. What I found was a casual family restaurant with a distinct international taste serving food from all corners of Asia including Vietnam, Korea, Thailand, Singapore, and much more. Those of you who have driven by without stopping for a bite may want to reconsider. I for one was pleased with my visit and left feeling full and refreshed. The restaurant I had lunch at was called Asian Dining, but it’s only part of a complex surrounding the tree shaped restaurant called Banyan Town. If you’re driving south on highway 58, right after you pass the tree shaped restaurant, take the first left turn. A short distance ahead, there will be a free parking lot on your left side. Park your car and walk towards the large banyan tree and you’ll see an elevator. The elevator will take you directly to Asian Dining where you’ll be greeted and seated by a friendly staff. I visited Asian Dining during their lunch hours, so I was presented with a special lunch menu with four meals available: spicy fried rice (¥980), Korean style cold noodle (¥800), Thai style spicy curry rice with hard marinated chicken (¥980), and singapore style sauteed glass noodle (¥800). All of the meals are of very large proportions and come with a complimentary drink. I came with a party of three, so we were able to sample most of the menu. I had the spicy fried rice, and was pleased with the taste and size of my dish. My friends were all pleased too, and we were shocked when we discovered the bill was less than ¥3,000 for all of us to eat a full meal with drinks. That’s certainly rare in Japan! Also, the menu was written in both English and Japanese, and the staff spoke great english, so there were no language barriers for any of us. Asian Dining offers three separate meal time plans. From 11:30 to 3 p.m., lunch time is in effect. From 3 p.m. to 5 p.m., a new menu is used during tea time, and from 5 p.m. to midnight, a large dinner menu is available with delicious sounding dishes such as fried shrimp with mixed vegetables (¥630), sweet and sour pork (¥600), goya champuru (¥500), Korean style fried rice on a hot stone pot (¥690), and kimuchi (¥350). During dinner hours, meals are ordered as separate smaller dishes in an izakaya fashion, so if you come with a large group you can sample a lot more than you would with just one or two friends. On Fridays, Saturdays, and any day before a Japanese holiday, the dinner hours remain until 2 a.m., so plan ahead for a special summer party in a tree-shaped restaurant. I enjoyed my detour to the Asian Dining restaurant in Banyan Town. 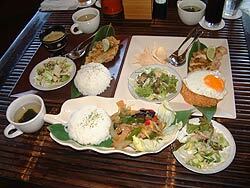 The food was great, the staff was friendly, and the service was casual yet comfortable. 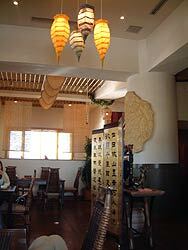 The setting was also clean and the restaurant had a pleasant Asian atmosphere. If you’re looking for an out-of-the-ordinary restaurant, this might be your winner. Reservations are available, but they are not required. If you would like to visit with a large group, they are recommended though. For more information on Asian Dining or to make reservations, call them at 098-859-6530.